According to The President’s energy blueprint, the Obama Administration is calling on Congress to establish a $2 billion Energy Security Trust to invest in breakthrough research into technologies, such as advanced electric vehicles, homegrown biofuels, fuel cells, and domestically produced natural gas. The funds would come from oil and gas royalty revenues generated from development in Federal waters off the Outer Continental Shelf (OCS). A new Energy Efficiency Race to the Top challenge as part of a larger goal to double American energy productivity by 2030. 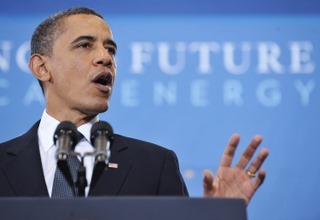 What’s your take on the President’s energy blueprint? How would you allocate the $2 billion Trust among the different areas? The only mention of nuclear power is “nuclear exports” and dealing with nuclear waste? That seems highly problematic. The blueprint, not surprisingly, sounds like a lot of what people more or less want to hear and can agree easily to. It doesn’t seem particularly groundbreaking. I’m somewhat disappointed that there is more focus on exporting nuclear technology rather than updating domestically. Outside of that, the hydrocarbon based policies aren’t much of a surprise, it’s more or less a hedge on ‘safe and responsible’ drilling.  Supports American nuclear exports. We are providing increased support for American nuclear technology and supply chains to promote safe, secure, low-carbon nuclear power growth in countries that are pursuing nuclear energy as part of their energy mix. As an aside, I’d say…. is that bit about exporting nuclear technology some sort of a nod to expanding international influence regarding other countries nuclear programs?